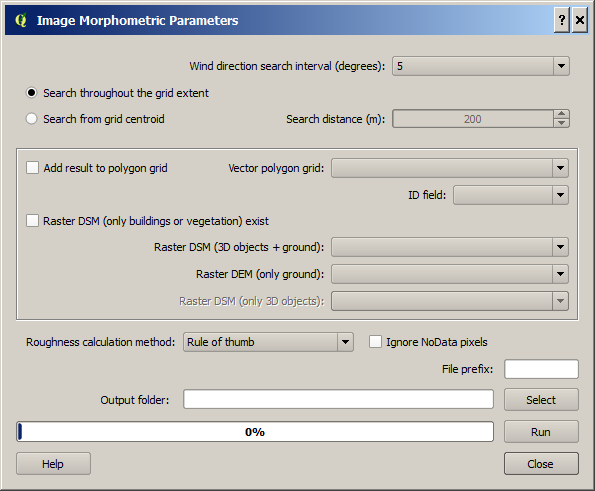 The Morphometric Calculator (Grid) pre-processor calculates various morphometric parameters based on digital surface models. middle Specifies the input data regarding 3D objects and ground as well as specifying what grid that should be used. lower Specifies output and runs the calculations. Select if the search should be performed from one side of the grid to the opposite side. Select the other option (Search from Grid Centroid if the search should start from the centroid of the grid. Setting the Search distance can then allow for the search to extent beyond the grid. See the figure below for illustration. 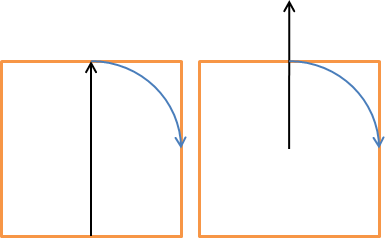 The left one performs a search using the grid extent whereas the right illustrates a search from the centroid and extending outside of the grid. This decides the interval in search directions for which the morphometric parameters will be calculated. Here the grid polygon layer should be specified. Choose an attribute from the selected polygon layer that will be used to separated the different polygon objects from each other. An attribute field of unique numbers or letters should be used. Tick this in if you would like to save a isotropic results in the attribute table for your polygon vector grid. Tick this in if a 3D-object DSM without ground heights is available. 3D objects (e.g. buildings) should be metres above ground. A raster DSM (e.g. geoTIFF) consisting of ground and e.g. building height (metres above sea level). A DEM (e.g. geoTIFF) consisting of pixels with ground heights (metres above sea level). A DSM (e.g. geoTIFF) consisting of pixels with object (e.g. buildings or vegetation) heights above ground. Pixels where no objects are present should be set to zero. Options to choose methods for roughness calculations regarding zero-plane displacement height (zd) and roughness length (z0) are available. A prefix that will be included in the beginning of the output files. Tick this in if NoData pixels should be ignored and calculation of grid should be performed eventhough NoData pixels exists within that grid. Nodata pixels are set to the average pixel values of the DEM. A specified folder where result will be saved. Two different files are saved after a successful run. Anisotropic result where the morphometric parameters for each wind direction as selected are included. Isotropic results where all directions are integrated into one value for each parameter. All DSMs need to have the same extent and pixel size. Polygon grids must be squared (or rectangular) and allinged with the CRS used. This will be fixed in future versions so that any shaped grid can be used (see issue #12 in the repository).